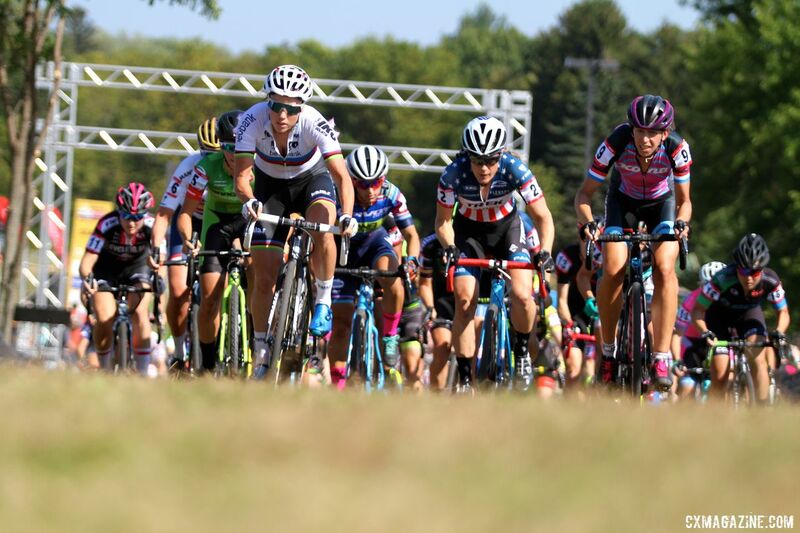 As was the case Friday and Saturday in Iowa City, fans approached Friday’s C2 race in Waterloo wondering which riders would take the starting line ahead of Sunday’s World Cup. The early weekend races have provided an opportunity to race for UCI points and payouts, but at the same time, several riders have chosen to keep their powder dry for the World Cups. Friday’s race gave riders a chance to preview Sunday’s World Cup course at race pace, but with temperatures nearing 90 degrees, there was a risk the hard effort in the heat could adversely affect Sunday’s fitness. Riders would have been forgiven if they skipped Friday’s hot and muggy race, but an impressive group of women took to the start line in Waterloo. Katie Compton (KFC Racing / Trek / Panache) decided to test her shoulder and she was joined by world champion Sanne Cant (Beobank-Corendon), Kaitie Keough (Cannondale p/b Cyclocrossworld.com) and others for a pre-World Cup tangle. After going down hard on her shoulder in Iowa City on Sunday, Compton wanted to use the race as a test run for Sunday’s World Cup. However, the conditions would make the test a difficult one. Compton looked like the Compton of old when she quickly moved to the field and got off the front with Sanne Cant in lap two. 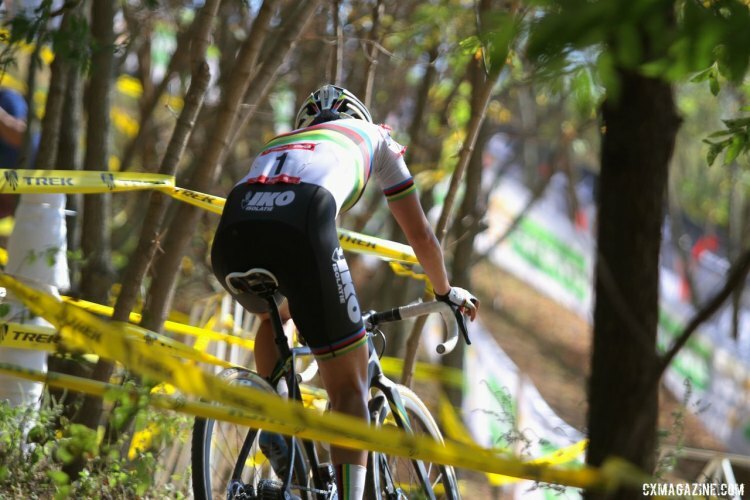 Compton put the injury behind her, but she still had to dig deep to knock off the defending world champion at her home away from home Trek Bicycles. 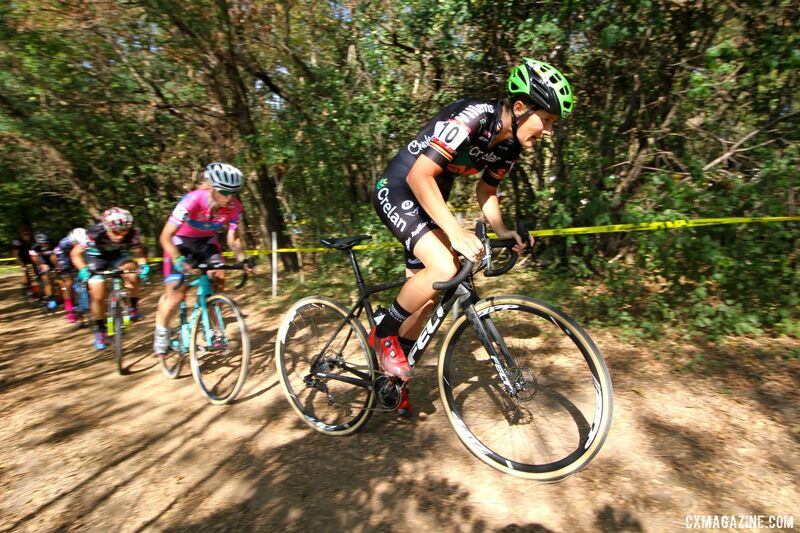 If fans and racers at the 2017 Trek CX Cup remember one thing about Friday, it will be the extreme heat that permeated the air in Waterloo. Race organizers made sure to have plenty of water and cold towels available for riders after their all-out efforts in the heat and collapsed riders at the finish line were a common sight all afternoon. With such oppressive conditions, riders would have been forgiven if they took it easy until later in the race. Helen Wyman (Kona Bikes) had other ideas early on and shot to the front as the field moved up and over the barn-themed flyover. In her Wyman Wednesday diaries, Wyman has alluded to not being a fan of the heat, so the early attack came across as a concerted effort to flip the script on her thermal nemesis. 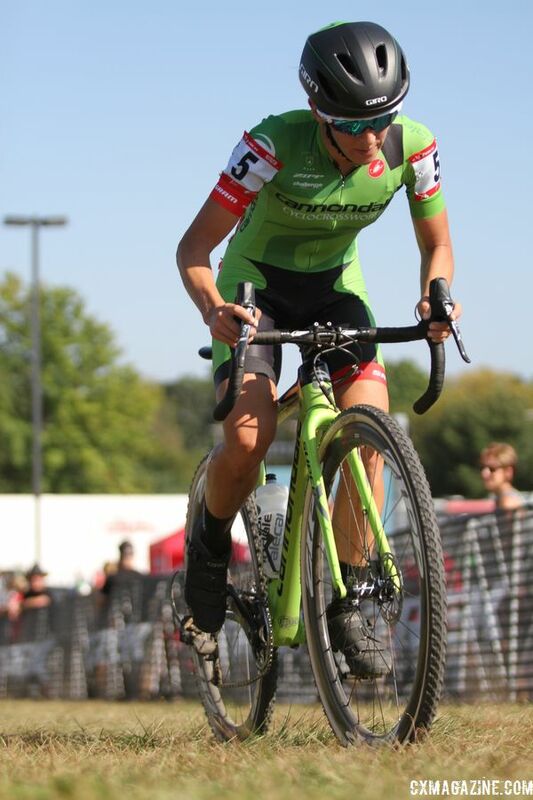 At Sunday’s Jingle Cross World Cup, Sanne Cant got off to a slow start and got caught in a bad position when Katerina Nash made her winning attack. Cant was determined to not make the same mistake twice and pulled into the leading position midway through the first trip around the circuit. Cant and Compton traded turns on the front and sped up the pace of the group of five riders that assembled at the head of the race. The other riders along with the two powerhouses were Keough, Wyman and Christel Ferrier-Bruneau (Sas-Macogep-Aquisio). 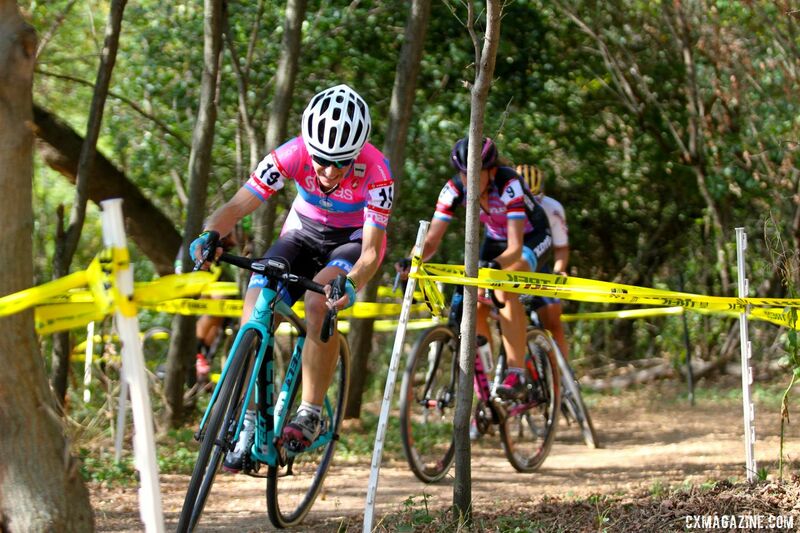 A big moment in the race occurred in the woods after the flyover when Keough dropped her chain and was forced into a chasing role for the remainder of the afternoon. 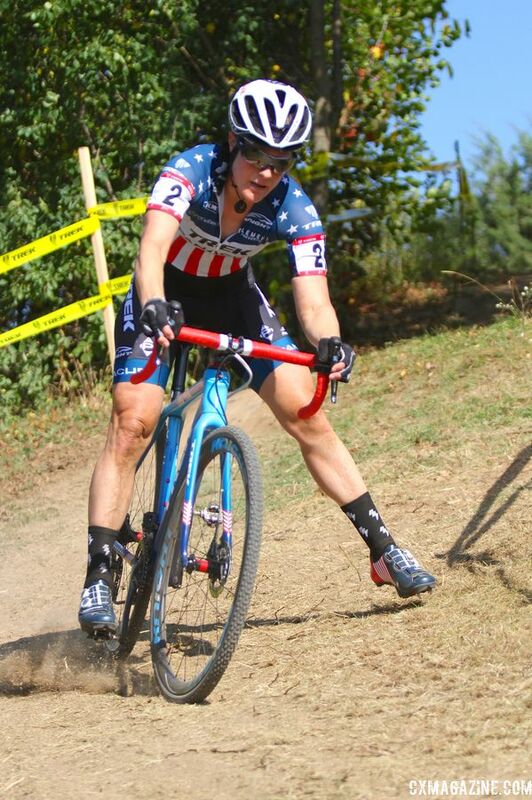 Keough finished seventh, but she never recovered to affect the front of the race. 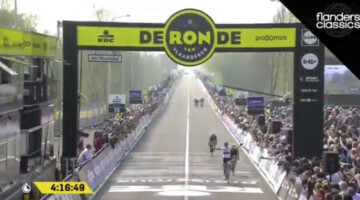 After Keough’s misfortune, Compton and Cant continued their acceleration and opened up a five-second gap back to the chase of Ferrier-Bruneau, Nikki Brammeier (Boels Dolmans), Wyman and Loes Sels (Crelan-Charles). Even though the race was only a C2 in the middle of a workday, the stage was set for an epic battle between two legendary riders. Cant and Compton quickly extended their gap back to third to 13 seconds by the beginning of the third lap. Having dispatched the rest of the group, the two were ready to start throwing attacks at each other. The duel, however, would be short-lived. One of the technical features on the course is a set of two log stairs about six to eight inches high. The first stair has a narrow opening to facilitate hopping over the second log and not having to waste precious seconds dismounting. 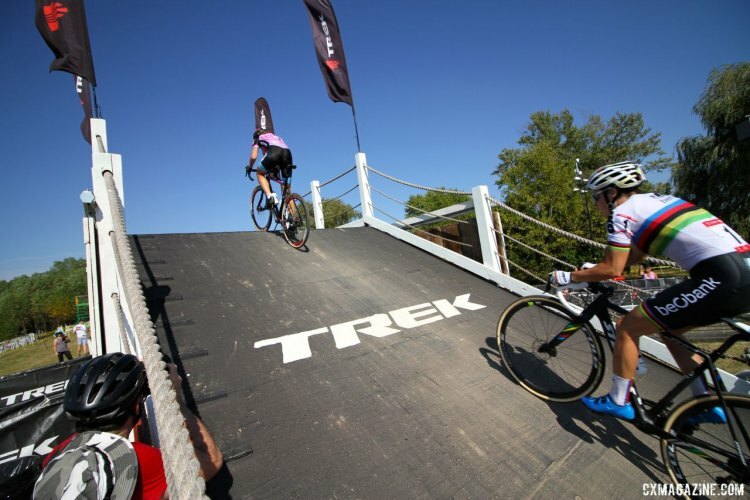 During pre-ride Sanne Cant was seen dialing in her line over the feature and helping Sels master the challenge as well. Unfortunately for Cant, pre-ride perfection did not translate into race success. Cant hit her wheel on the second stair and tumbled off her bike. The crash cost her precious time that would be difficult to make up against Compton. Surprising no one in the large crowd gathered around the feature, Compton attacked to exploit the costly mistake. Compton’s gap was quickly 10 seconds, and she extended it to 13 seconds by the end of the lap. Even though Compton was away, her victory was by no means secure at the start of the fourth of six laps. Cant reduced the lead by a second or two when the riders passed over the flyover and with the heat, even a ten-second lead did not seem secure midway through the race. Cant’s threat to Compton’s lead, however, was short-lived. Cant again bobbled on the stairs and Compton’s escape was secured. The 13-time defending U.S. national champion metered out her efforts for the rest of the afternoon to win comfortably while not going too deep ahead of Sunday’s World Cup. Although Compton and Cant were gone off the front, the story of the chase early in the race was Ferrier-Bruneau. 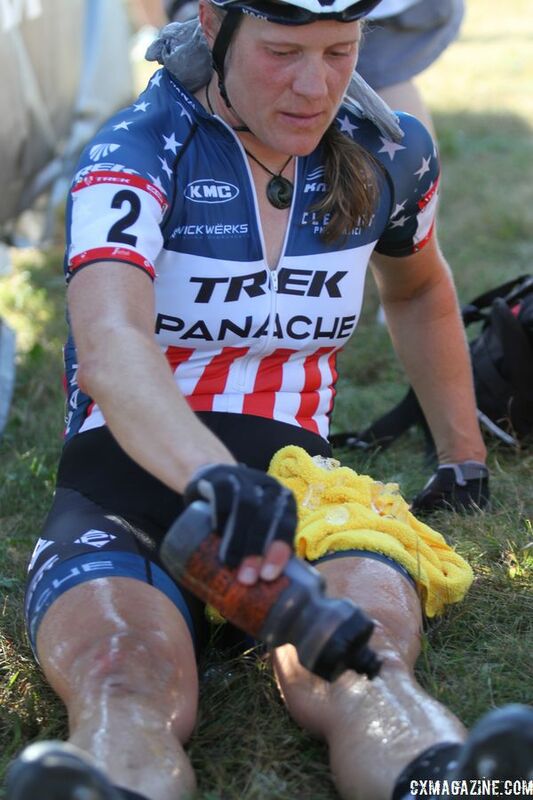 Ferrier-Bruneau, who is from France but lives in Canada, officially retired as a professional cyclist in 2013, but she started racing on the U.S. UCI circuit again in 2016. After Compton and Cant attacked, Ferrier-Bruneau also opened a gap back to the other riders in the chase. Her advantage held at four to seven seconds well into the fourth lap while Brammeier and Sels tried to close the gap. After Cant’s second crash at the stairs, Sels moved into third and Cant dropped back before dropping out of the race at the end of the fifth lap. When the chase got the bell, Sels and Ferrier-Bruneau were wheel-to-wheel and the race for third was on. Sels worked hard to make contact with Ferrier-Bruneau, so would she still have enough to make the winning kick or would Ferrier Bruneau get a second wind to hold onto second place? The decision in the last lap went to Sels. The wooded section in the northwest corner of the course put a premium on technical skills, and Sels was able to take advantage to gain space when the two riders passed the stairs. She held the gap and cruised to a comfortable second-place finish. Ferrier-Bruneau finished her impressive ride in third, Brammeier finished fourth and Crystal Anthony (Maxxis-Shimano) rode a solid fifth. Ferrier-Bruneau finished her impressive ride in third, Brammeier finished fourth and Crystal Anthony (Maxxis-Shimano) rode a solid fifth. Elite-level racing in Waterloo culminates with Sunday’s World Cup Waterloo. The Women start at 2:00 p.m. and the Men begin at 3:30 p.m. Central. 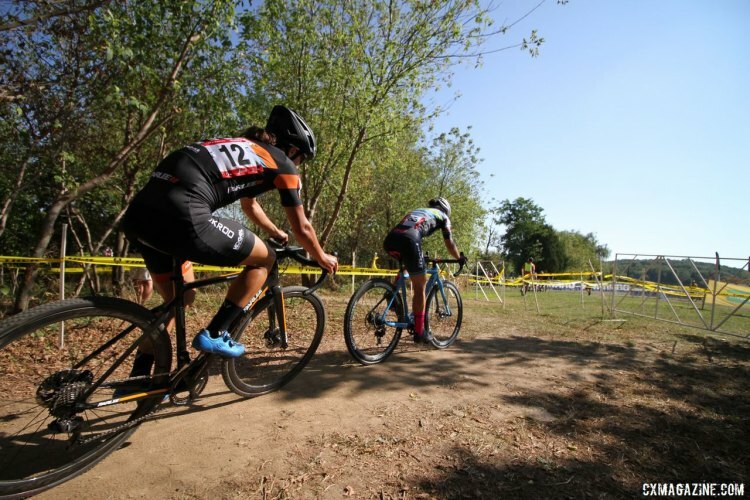 Amateur racing continues as part of the Trek CX Cup on Saturday. 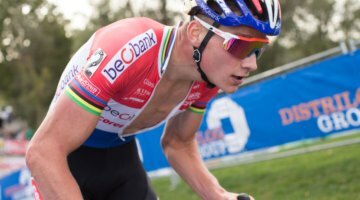 Stay tuned to Cyclocross Magazine2017 Trek CX Cup and World Cup Waterloo for continuing coverage of the . 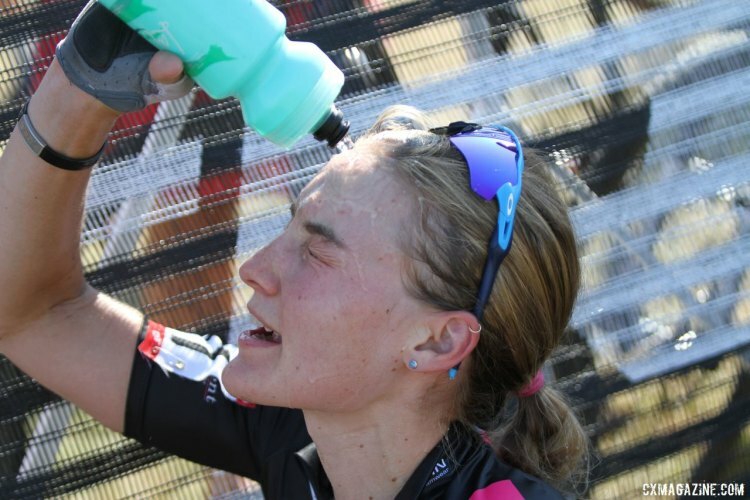 Temperatures are again expected to be in the 90s on Sunday, so scenes like Elle Anderson (Cycling.be – Alphamotorhomes) cooling off after the race are likely to be common again. in 2016 Loes Sels was dropped by Telnet Fidea. She was called a ‘hobbycrosser’ by the Belgian national coach who didn’t think she was worth sending to worlds. Her comment was “I traveled to the United States for the World Cup for ten more days this year (2016). That cost me and my partner 4,000 euros. That was a heavy investment. With that money we could do something else. But I take my sport seriously and I want to be there. And I want to drive results too. The 32 year old mother of 2 is showing her grit. Amazing result. That is really cool. We had heard a bit about that, but did not know all the details. Thanks for passing that note along.